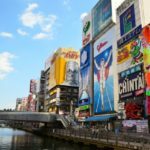 Osaka is the largest city in the Kansai area which is called the town of Kuidaore (ruin oneself financially by one’s extravagance in food). 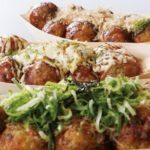 You can enjoy the tako-yaki, okonomi-yaki and kushi-yaki which have been representing the gourmets in Osaka! But actually, you can enjoy many other delicious foods here in Osaka! I’m introducing the restaurants where you can taste sukiyaki! I’ve picked up the 10 carefully selected ones which are especially recommended in Osaka. So, please try and taste one! 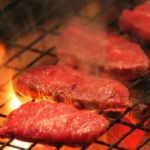 The [Yakiniku, Sukiyaki Jun Umeda Honten] is directly managed by the JA ZEN-NOH (National Federation of Agricultural Cooperative Association) Meat Foods which is in the center of Umeda. You can sit at the spacious relaxing horigotatsu-seat (low table over a hole in the floor) and enjoy the first-rate Japanese beef for a reasonable price. This restaurant’s signature menu is the sukiyaki, using the top-class sirloin with a special cut. Especially, the [yakisuki] in which the slightly seared price rib-roast mixed with egg-yolk is special. 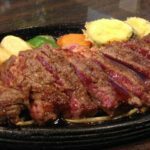 The [Zeitaku-yakiniku-nomihodai] for ¥5,000 which has first-rate grilled meat, yukhoe (Korean dish) and yakishabu are also popular on the menu. If you want to enjoy the delicious sukiyaki without any sense of hesitation, this restaurant is for you! The [Edogiku] is a conventional charming detached house restaurant with a hideaway atmosphere established 100 years ago. 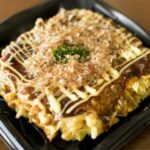 The mellow A-5 rank first-grade Matsuzaka-beef sukiyaki with the secret miso and eat it mixing it with the beaten-egg is the superb dish which you want to enjoy when you visit Osaka. The vegetables and tofu simmered in the special broth soup which has been handed down since its establishment absorb the flavour and savour of the meat and it is super tasty. There is no one who doesn’t know the [Harijyu] established 100 years ago in Osaka. When you step into the Daihoji restaurant in the [American village] which has been gaining high popularity as one of the sightseeing places in Osaka, you can experience the long-established flavour in the good olden Japanese atmosphere just like an inn with the style of a tea-ceremony hut, forgetting the bustle of the big city. The high-quality black-beef sukiyaki with the special broth soup costs ¥8,500. The fresh egg and melty beef texture is excellent. It is the [Harijyu]’s representative dish along with the shabushabu with the special ponzu (sauce made of soy-sauce and citrus juice) and gomadare (sesame seed sauce). 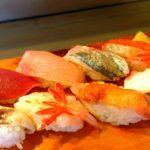 Please enjoy the traditional taste which has been entertaining not only the connoisseur of good food in Japan but also the ones from around the world until you are gastronomically happy. The [Kitamura] established 130 years ago, in the 14th year of Meiji (1881) is a historical [speciality for sukiyaki] restaurant which has been operating in the same place since its establishment. 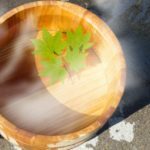 The restaurant with the style of a tea-ceremony hut has a patio and you can taste the superb sukiyaki in the relaxing room with the pure Japanese-styled relaxing atmosphere.The sukiyaki at the [Kitamura] (¥9,800) is not cooked in the broth soup. It is a conventional Kansai-styled one which is grilled on the special Nanbu (Iwate prefecture) Ironware. You can enjoy the original flavour of the carefully selected Japanese beef-roast. 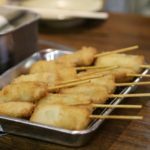 The Mizutaki (¥9,800) which is tasted with the ponzu (sauce made of soy-sauce and citrus juice) as well as the butter-yaki (¥10,500) with plenty of grated radish and soy-sauce to keep the original flavour of the meat is popular. Please enjoy exquisite sukiyaki at the famous restaurant in Osaka. The [Sekiguchi] which was the second house of a family in Hamadera in the Sakai-city has been removed and re-built. It is now the charming pure Japanese-styled house restaurant with a long history, 140 years have passed since its establishment. You can enjoy your meal in the refined private room, being far away from the noise of a big city. The sukiyaki at the [Sekiguchi] (¥5,000 ~ ¥12,000) is the classic Kansai-styled one in which the first-grade Japanese Black (breed of cattle) beef is grilled with the special granulated sugar and the elaborate soy-sauce from Kyoto and you can taste it mixing it with the dissolved yam in the broth soup. When you visit Osaka, you may be keen on tasting this proud tradition, 140 years since its establishment. 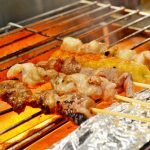 The shabushabu which emphasizes the flavour of the meat (¥5,000 ~ ¥12,000) as well as the butter-yaki (¥5,000 ~ 12,000) which is grilled on the special iron pan is also popular. There is no doubt that you will be highly satisfied. The [Kanoya] is a sukiyaki restaurant with a calm atmosphere and the red noren (shop entrance curtain) as their landmark. It is somewhat a hideaway restaurant with only 20 seats. It is a famous restaurant which was introduced on the TV program and they have been particular about the Japanese Black (breed of cattle) beef. You can enjoy the sukiyaki, using the [Waichi] (brand) where the amount served is small and of very precious high-quality Black (breed cattle) beef for ¥9,200. Apart from the sukiyaki, you can taste the beef steak (¥9,200) and the shabushabu (¥9,200) at the [Kanoya] which is concentrating on the original quality and flavour of meat. The mellow sweet flavoured beef has the texture which only high-quality Japanese beef can provide. It is the recommended restaurant that I want you to visit and taste their dishes. If you talk about an original shabushabu restaurant, it is this [Suehiro]. The interior of the restaurant has the sophisticated charming Japanese atmosphere. You can spend some quality time there. The [Suehiro] which started its business as the high-quality beef dish restaurant is particular about the flavour and quality of the meat. The shabushabu and sukiyaki, using the quality Japanese Black (breed of cattle) beef on which the skilled chef directly gives an expert opinion is excellent. Introducing this sukiyaki at the [Suehiro] (¥6,500 ~ ¥11,100) has the characteristic that they put some milk in the broth soup as a secret flavour. It makes the flavour mellower and richer. They are also choosy about eggs which should have a rich and profound taste, that is Nekka-egg. The sukiyaki dipping in the Nekka-egg is the taste of this famous restaurant which you would surely like to try. Why don’t you luxuriously sample the sukiyaki in [Ginza] on the top-floor of the Shin-osaka Washington Hotel? You can command the night-view of the townscape of Osaka from the table-seat. The spectacular view will encourage the lovely taste of the dish even more. The famous dish is the sukiyaki (¥6,700 ~ ¥11,200). 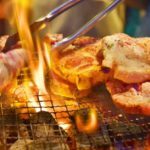 In addition to the [Satsuma Black (breed of cattle) beef] and the [Ohmi-beef], the local beef has been prepared, adjusting to the type of gathering. You can enjoy those meats in sukiyaki with the profound richness and mellow flavour. The shabushabu in which you can directly taste the quality of the meat and the seasonal Kaiseki-ryori (Japanese-styled course menu) where you can enjoy the [Japanese cuisine] are also recommended. As the restaurant has an expert on sake, you can enjoy the sake which suits the dish as well. The [Sukiyaki Ichiban] has been gaining in popularity and you can taste the first-class A5 Japanese Black (breed of cattle) beef in the fashionable restaurant put together by a famous designer for a reasonable price. The all-you-can-eat first-grade marbled meat is ¥2,980 and the special course is ¥4,980 ~ ¥6,980 both of which are attractively reasonable. Their sukiyaki with the mixture of the broth soup which has been loved at the restaurant in Kyoto and the high-quality meat is completely targeted on its flavour and quality. A popular Korean star in Japan has visited this restaurant, I’ve heard. As it is close to the station, it’s easy to get there. When you want to fill yourself with sukiyaki, this is the restaurant which I would like to recommend. The sukiyaki (¥14,000) at the [Shabukichi] is an excellent dish, using the part of beef for steak from the super high-quality brand, Saga-beef. At lunch time, you can eat the Japanese Black (breed of cattle) beef sukiyaki for ¥950. Please sample it! Let’s eat exquisite sukiyaki in Osaka which is a Kuidaore town! (ruin oneself financially by one’s extravagance in food). 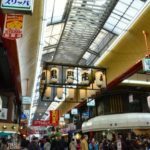 The town of Osaka tends to give you the impression of tako-yaki (octopus dumpling) or okonomi-yaki (Japanese pancake with vegetables) represented by Dotonbori and Shinsaibashi, but it actually has various types of delicious gourmets. Sukiyaki is one of them. I hope you can choose the restaurant among the casual ones and the long-established ones with the charming appearance of the restaurant, adjusting to your situation and usage. 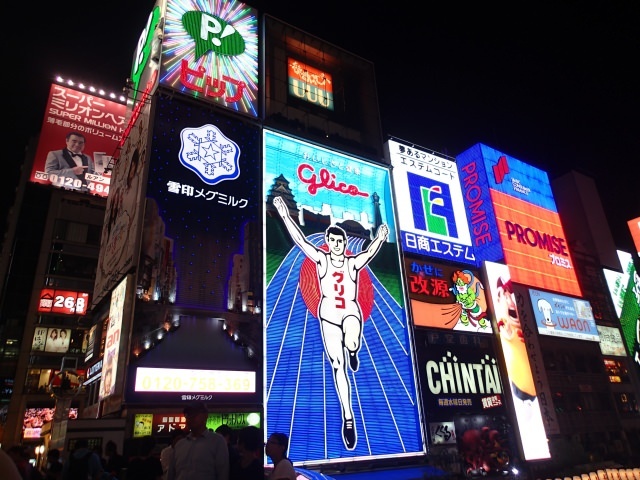 Please fully enjoy the gourmets in Osaka!